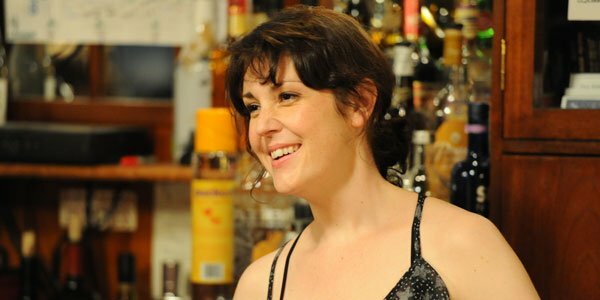 New Zealand actress Melanie Lynskey made her breakthrough into movies and cinema history with Peter Jackson's true-crime drama Heavenly Creatures back in 1994. Since then, she's become an actress utterly beloved by critics and indie movie fans for her layered performances in films like Win Win, Away We Go, Up In the Air and Hello I Must Be Going. 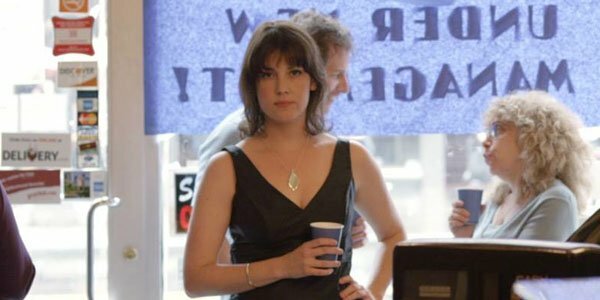 In the new-to-iTunes comedy Putzel, Lynskey learned to embrace her inner shiksa to play Sally, the spunky center of this raunchy rom-com's tricky love triangle. Putzel stars Jack Carpenter (I Love Beth Cooper) as Walter "Putzel" Himmelstein, a neurotic New York Jew who has become so engrained into the daily operations of his family's Upper West Side bagels and lox shop that the very thought of stepping outside the neighborhood fills him with crippling anxiety. He attempts to buckle down and prove to his uncle Sid (John Pankow) that he's ready to run the shop on his own, but their plans get disrupted when a sassy dancer named Sally (Lynskey) waltzes into their lives, and steals both their hearts. Full Disclosure: I worked on Putzel. Years ago, I was handed the script when my friend, Jason Chaet, was gearing up to begin pre-production on his feature directorial debut. After reading the sweet and hilarious screenplay by himself and Rick A. Moore, I told Jason I'd help out in getting Putzel made in anyway I could. Ultimately, this ended up meaning a few days on set as a production assistant, and a few months on call as the film's assistant editor. It was a rare and extraordinary opportunity not only to see something I'd so admired in concept being sculpted into a vibrant and funny film, but to also be a part of that process. With the film out on iTunes, I reconnected with Chaet and his leading lady Lynskey to share some of the filmmaking process's quirkier points. Even with celebrated indie producer Mary Jane Skalski on board, Putzel was a low budget production. But Chaet pointed out that shooting on location as much as they did gives Putzel all of the inherent production value of New York City in full swing. "There is no greater back lot in the world than NYC. And the best part for lower budget films like ours is because of the setting, it doesn't have to look low budget. We tried to be ambitious in how we shot on the UWS, and use it to maximize the production values in the film…A lot of audiences think the movie cost five to ten times to make than it actually did. A great deal of that is because of the production value from NYC locations." His advice to other filmmakers is get all the proper permits, and schedule them for early in the day, like 3AM. That's how Putzel managed to shoot its opening and closing shots without fighting the massive hubbub of Columbus Circle's later-day crowds. Chaet tried to shoot specifically in the Upper West Side as much as possible to emphasize how New York's neighborhoods function very much like small towns. This strategy worked well for Lynskey, who shared, "It really helped give the sense of how small Walter's world is." She also noted, "It's so exciting to film in New York- there's just an energy you can't fake. It's beautiful, and I'm from New Zealand, so filming a movie on the streets of New York is so crazy and exciting and like 'how did I get here.' It just feels like a dream." Being confined to the Upper West Side isn't something new to Chaet. It was actually part of what inspired the script. When Chaet and Moore were brainstorming concepts for projects, the former realized he hadn't left the Upper West Side of Manhattan for months. "It was a time in which I was living there, working there, and all of our friends were still in the area," He explained. "Yes, it's bizarre, but it was true. When I said I hadn't left in months Rick said 'That's a movie...', and I agreed. It took us some time to figure out what movie it would be, we went down a lot of strange paths with it, until finally Rick had the very good idea to set it in a smoked fish emporium, an appetizing shop, which is a very Upper West Side business. I thought that was a great idea, so we ran with it." Chaet confessed another major inspiration for Putzel is Billy Wilder's New York-set classic The Apartment. Structurally, the two have similarities down to the central love triangle, and the importance of keys to the plot. This makes Lynskey the movie's plucky MacLaine heroine. Lynskey didn't site The Apartment or any other movies as inspirations in her performance of the film, but did admit she was attracted to Sally's stubbornness, a characteristic that she noted can be as must of a virtue as a vice. But for Lynskey, the greatest challenge of making Putzel was forging distinctive and believable romantic bonds with two men who have so little in common. She told me, "The dynamic was so different with both characters and I wanted to be mindful of showing how it was different with Walter. I was looking for the moments where she was unable to control how she was feeling and just be cavalier about the whole thing, and she was trying to cover some real feelings. Luckily that was very present in the writing but energetically it was important I showed that she was feeling very different things." Regarding working with Carpenter and Pankow, she said, "They're both wonderful people and great actors. I feel like with John I did more sort of reacting to his energy….He's hilarious and I loved working with him. Jack and I really had to open our hearts to each other and allow ourselves to connect, so the chemistry would be real and you'd believe that these two very different people are meant to be together." New Yorkers can be wildly unimpressed that a movie is shooting on their block. Working as a P.A. during the shoot at Putzel's central location of a UWS bagel shop, I learned this first hand. Even with a camera crew and a heavy remodel of the shop interior and exterior, residents kept weaving through crewmembers to try to get their morning bagel fix. They would not be deterred. Chaet recalls, "We shot everything in the store in a bagel shop while it was closed for Passover. So the bagel store was closed for business, but it looked open. There were countless times that people walked in trying to buy bagels while we were shooting, or about to shoot. Most people figured it out right away, but I remember a couple people didn't believe the crew who asked them to leave, and they kept trying to order. It became a running gag the whole week. And of course there are the typical shooting on NY streets moments - actors get recognized and people try to talk to them while we're rolling. 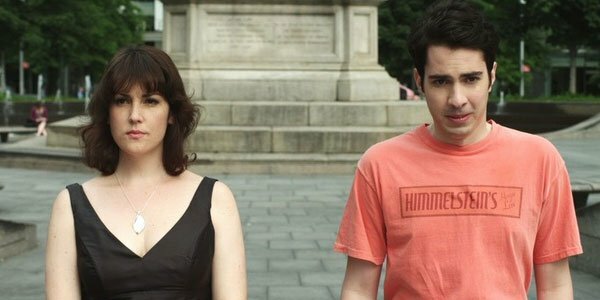 That's always fun when I'm on monitor a block away and some lady is explaining to Melanie Lynskey--while she's trying to do a scene--how much she loves her on Two and a Half Men." Lynskey fondly remembers these interruptions too, but to her working with Carpenter was even funnier and stranger than New Yorkers demanding their bagels from camera assistants. "I just think Jack is such a great actor," she said of the experience. "And he and his incredible wife Michelle are now two of my closest friends and I cannot imagine my life without them, so thank you forever, Putzel." In Putzel, Sally scrapes by as a bartender between gigs as a dancer. And she goes out on a date that starts off pretty dismal. But when I asked Lynskey about her own struggles with infuriating survival jobs or terrible dates, she admitted she could relate, but declined to name names. Since her screen debut in Heavenly Creatures, Lynskey has been working pretty steadily in film and television. But when she needed some extra cash, she has turned to waitressing or babysitting. Of those times, she says, "I was grateful that I had those jobs and was able to pay my bills. Having said that, there have been a couple of movie experiences that I would not want to repeat even if someone told me I'd get a million dollars for the reshoots." Just as she wouldn't tell us which productions were so frustrating, she shied away from sharing details on her worst date, explaining, "I'd hate to describe a situation that maybe wasn't the greatest for me and have someone read it and feel bad about themselves." But if your date is getting off to a bad start, she suggests you take a cue from Putzel and "Drink peppermint schnapps" to turn it around. Putzel is now available on iTunes.